The sun is out! And we are ready to work, rest and play! This year's Plant Sale and Healthy Living Community Day is set to be extra special! As well as a wonderful day for our lovely community, this year's event brings together our Student Garden Party and signifies the launch of Share Nurseries, a gardening social enterprise of Share Community. Share Nurseries will provide key employability skills and opportunities for our students while providing quality plants, produce and garden creations for the local community. So join us on Saturday 2nd June 2018, from 10am to 4pm, in the Share Garden in Tooting to help us celebrate the launch of Share Nurseries, get active with our free exercise workshops and cycling and enjoy a little (healthy!) treat from our pop-up café and street food stalls. Find out more or register for the event on the Share website or contact Jenny Bourlet via email jennyb@sharecommunity.org.uk or telephone 020 7801 9813 to see how you can get involved. Thanks to a grant by Sport England, this year, Share students will be able to take part in additional sport and exercise sessions, including cycling, chair-based exercise workshops and movement dance. As Share continues to work towards becoming autism accredited, we are asking all stakeholders to take part in surveys to provide feedback about their experience of using, and working with, Share. Stakeholders include our current autistic students, their family members, and professionals that work with Share but who are not employed by Share. The deadline for responses is 13th May 2018, and surveys cannot be completed after this date. Share celebrated World Autism Awareness Week this year by launching a student interest group – Spectrum – for our autistic students. 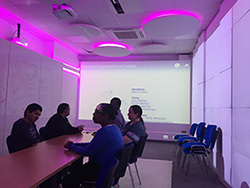 Almost all our autistic students also have learning disabilities, so the aim of this group is to explore what autism means to them, how it affects them and discuss how Share can help them to develop strategies to support them better during their time at Share. Share's Wellbeing Team has a wide remit, but its ultimate aim is to make sure that each student's journey at Share is fulfilled, safe, supported and happy. 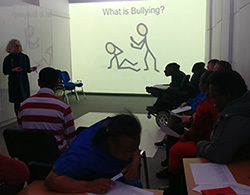 This month's wellbeing focus highlighted the importance of being respectful and kind to others – Eastenders style! At Share, we take fun very seriously! 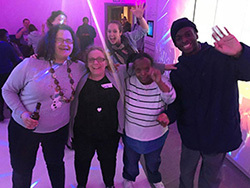 Earlier this month, the Go Anywhere, Do Anything team got together with new and current social buddies, as well as members, for induction and refresher training to make sure everyone going out and about is supported appropriately and has fun safely. And, of course, this also presented the perfect excuse for a party! 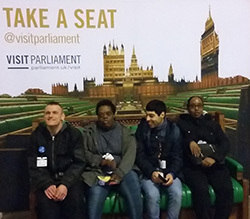 Share's independent living skills students are currently learning about Law & Order, which this month included a trip to the Houses of Parliament. At Share, all our courses aim to combine in-house training with practical, community-based learning, which gives our students access to new opportunities and experiences to reinforce understanding and enhance their studies. 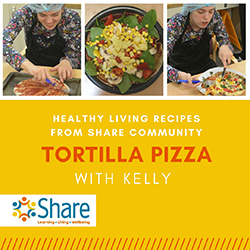 In this month's recipe video, Kelly shows us how to make a healthy (yes, healthy!) Tortilla Pizza. This is one of 12 recipes appearing in Share's Impact Report for 2016/17 which this year is a recipe calendar. Each video recipe of the month also appears on Share's YouTube channel. Check out recipes from previous months. A reminder that our next Parents/carers' meeting will be on 23rd May 2018, from 11am to 12.30pm. Friendship and dating is an area that parents and carers have told us is important to them and the person they care for. So for Share's May Parents/carers' meeting, we've invited, Helena Reed of Happily Dating, a social enterprise that supports people with learning disabilities and autism to make new friends and start relationships within a safe environment, to tell us more about this topic. We hold parents/carers' meetings every two months at Share's offices in Battersea. These meetings are an opportunity for people to tell us how we can support them and the person they care for better.